Book News: Jane Austen To Replace Darwin On The 10-Pound Note : The Two-Way Also: the history of blurbs; Buzzfeed launches a book section. 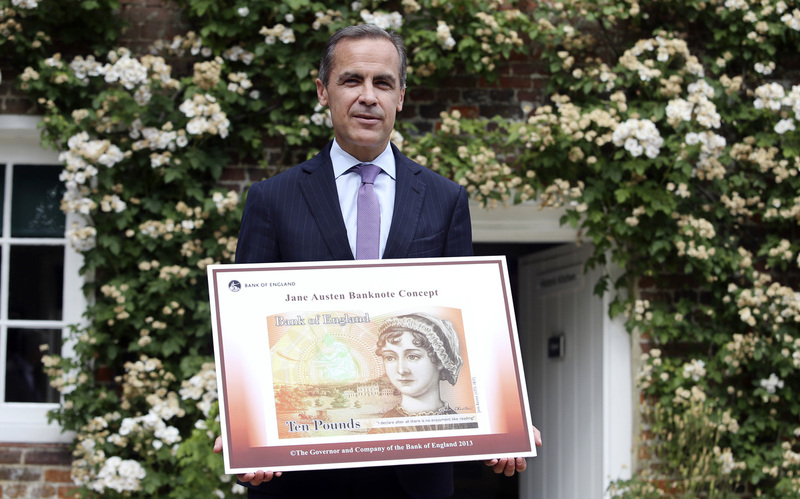 The governor of the Bank of England, Mark Carney, displays the concept design for the new 10-pound banknote featuring author Jane Austen. Jane Austen will be the new face of the 10-pound banknote, replacing Charles Darwin, the Bank of England announced Wednesday. That follows an uproar after the bank said it would replace Elizabeth Fry — the only woman to appear on a banknote other than the queen — with Winston Churchill on the 5-pound note. Austen's portrait will be accompanied by a quote from the insipid Miss Bingley: "I declare after all there is no enjoyment like reading!" Buzzfeed has launched a books page, and it's exactly what you'd expect. A sandwich-themed reinterpretation of Yeats' "Second Coming" reads: "Turning and turning in the widening gyro / The kebab cannot hear the kebaber; / Wraps fall apart; the centre cannot hold; / Mere anarchy is loosed upon the world." For The Millions, Alan Levinovitz writes a history of back-cover blurbs: "The excesses and scandals of contemporary blurbing, book and otherwise, are well-documented. William F. Buckley relates how publishers provided him with sample blurb templates: '(1) I was stunned by the power of [ ]. This book will change your life. Or, (2) [ ] expresses an emotional depth that moves me beyond anything I have experienced in a book.' ... My personal favorite? In 2000, Sony Pictures invented one David Manning of the Ridgefield Press to blurb some of its stinkers." The Flamethrowers author Rachel Kushner lists her favorite art books in The Guardian. She says of Feelings Are Facts by Yvonne Rainer, "This is the motherlode, as a crash course on the art and artworld social scene of the 1960s and early 1970s in downtown New York, with in-depth portraits of the main personalities, in all their glory and sordidness." The book-recommending website Goodreads says its membership has doubled in the past 11 months and now has 20 million members. The site was recently bought by Amazon, despite an uproar in literary circles, but the move doesn't seem to have put off potential members. In a spree that lasted for years, Anders Burius, a librarian at the National Library of Sweden, stole more than 50 rare and valuable books and sold them to collectors. Two of these books, worth a collective $255,000 according to the library's lawyers, were returned Wednesday at a ceremony in New York. After the thefts were discovered, Burius confessed to the crime in 2004 and committed suicide soon after. Baltimore bookstore owner Stephan Loewentheil had bought and then sold the two volumes, but he bought them back at his own expense after finding out that they were stolen.